As the global cosmetics industry continues to grow and evolve with new trends, styles and innovations, the way in which these products are processed must also be modernized. With skincare, haircare, makeup and fragrances providing vast sums of revenue for manufacturers around the world, it is important that these products are of a consistently high quality. Throughout the processing of cosmetic powder products such as face powders, eye shadow and talc, vibrating screens can be used to guarantee product quality. 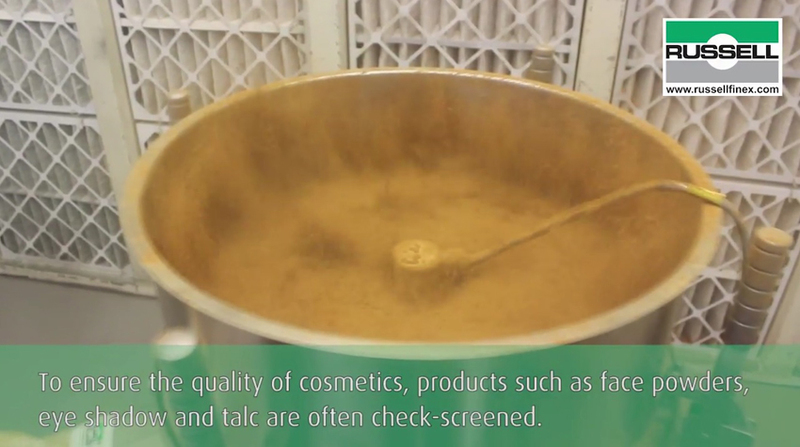 In a Russell Finex demonstration video, batches of face powders are check-screened using the Finex 22™ sieve. This industrial makeup screening solution automatically sieves the cosmetic powders, removing all oversize contamination and guaranteeing a consistently fine powder. A fully portable design means the sieving machine can easily fit into existing production lines, and be transferred easily between processes if necessary. These vibrating screeners are available with all-stainless-steel contact parts and can be quick and easily dismantled and assembled for cleaning, ideal for use with multiple powders. To further enhance performance, this high-frequency vibrating screen was upgraded with the Russell Vibrasonic® Deblinding System. This ultrasonic fine mesh sieving technology eliminates mesh blockages during the screening of fine and sticky powders, often used in cosmetic products. In fact, these systems can improve sieving capacities by up to 10 times, and increase product quality through screening on finer meshes, down to 20 microns. Contact Russell Finex today to discuss your cosmetic powder or liquid screening requirements.